MSE Creative Consulting Blog: How Dangerous Were They?? Below, I posted an item about what I was expecting to be very dangerous storms in southwest Kansas yesterday. How dangerous did they turn out to be? 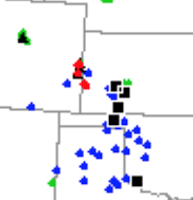 There were at least six tornadoes in southwest Kansas and far eastern Colorado yesterday (red symbols). Measured gusts of 117 mph are extremely rare.